Fringe Care: The foundation of your rug. Oriental and Persian rug fringe cleaning is an art completely separate from washing the rest of the rug. 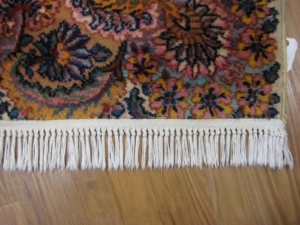 The fringes are actually the foundation of the rug, and must be cared for extremely carefully. Our intricate rug fringe cleaning process includes from fringe pre-treating, dye bleeding prevention, fringe cleaning to remove discoloration and browning, fringe whitener to restore vibrancy and softness to the rug fringes, and delicately drying and grooming with a handheld fringe brush. Before rug submersion and washing, we always perform a test for dye bleeding in a small inconspicuous area of the rug to check for colorfastness. Once we determine if the rug is a “bleeder,” we begin pre-treatment of the fringes with a special solution that protects in the event of dye bleeding. This step will also prevent browning issues from occurring after the rug washing and during the drying process. Our special rug fringe cleaning and pretreatment formulas are safe for all types of fringes. Under no circumstances is there ever a reason to use bleach during any part of the rug fringe cleaning process. Bleach and even oxidizers can disintegrate the fringes right before your eyes. It doesn’t take much to do it either. Instead, The Carpet Chemist uses a precisely formulated solution that gets fringes their whitest with absolutely no harmful side effects. Our customers love how much brighter their fringes look upon rug delivery. It’s typically the smaller things that people do consistently that sets them apart from other businesses in their field. When it comes to rug washing in Louisville, Kentucky we pay extra close attention to every single detail of our customer’s rugs. We have a huge 3000 square foot facility dedicated to rug washing and color restoration, but never let the small touches slip through the cracks. For instance, before, during and after the rug drying process, we hand-groom the fringes of the rug for the best drying experience possible, and because it ties the whole look of the rug together, giving it a sleek uniformed appearance, as if it were just hand woven yesterday. Not hand grooming the fringes would leave them looking scrunched up and wrinkly. Kind of like wearing a $2000 Valentino suit with wrinkles. For more vibrant whiter and better looking fringes, trust your rug and rug fringe cleaning needs to The Carpet Chemist. Upload a pic of your rug for an instant rug washing/ rug fringe cleaning quote. Our IICRC-certified team provides no-obligation estimates. Connect with our team at (800) 515-1342 or by using the secure form below.